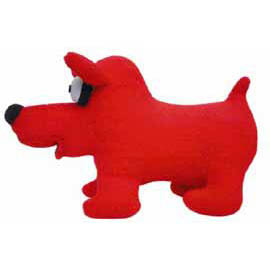 New Keith Haring Plush Dog, collect the whole family! Le Malin freely translatets from French into the "Bad/Crazy One" and that's exactly what this funny dog looks like. Made after original drawings by Keith Haring, these Plush Dogs are fully authorized by the Keith Haring foundation! Man's best friend in happy playful "Pop Shop" colors! Each of these makes a great gift for young and those who feel young. Look, play and be happy! Guarantees hours of fun and memories that will last a lifetime!